Researchers and searchers have a big hand in success and future business planning. Hello, welcome to one of the most important areas of how to distribute budget for a business. As for now, it is the time for annual budget planning for the best outcome for next session. Setting up a new business or finding a chance for exploring your business or products to the entire world. The e-advertisement or we can say ads as a paid search is the best for this. Bing provides a suitable platform for reaching direct to customers or we can say, consumers. Why do people spend on Bing ads Paid Search to growth their business. Paid Search, Where you have to pay for per click on your marketing campaigns and advertisement which appears on Search Engine Result Pages and Its display partner websites. For paid advertising, you can create different types of Paid Ads through Campaign into Ads tools, like Text Ads, which display on search engine result page only. Display Ads, Where your ads show on Search engine’s display network site. At this moment, Paid search is one of the best ways for Awareness of product and services on search engine result pages, People, who want to get a rapid result and better conversion from SERP, then they should use paid search marketing strategy than organic Search. Because of every user want to get information, Product, and services from search engine result’s first-page title and this is easily possible from Paid search only. We have some major factor what do people spend more on paid search. In the Paid advertisement, People can easily target their clients through there selected keyword. During creating any ads on search engine ads creation tools, like Google AdWords and Bing Ads. You can target relevant client which is real for your business as well as you can select some additional options, like demographics, Age, Budget, Location, and more thing you can select on paid search, according to your requirement. You have one Great advantage on Paid marketing, which will help you to save money from unnecessary clicks. For this, you have to use negative keyword function Within AdWords and Bing Ads which will help you to filter out unqualified traffics. #3 Overall Controls on your Bids and budget. If you are thinking about paid search it not means that you should need lots of money for this, you can also start your marketing with a minimum amount. It’s totally controlled by you and your budget, which you have fixed on your ads Group. 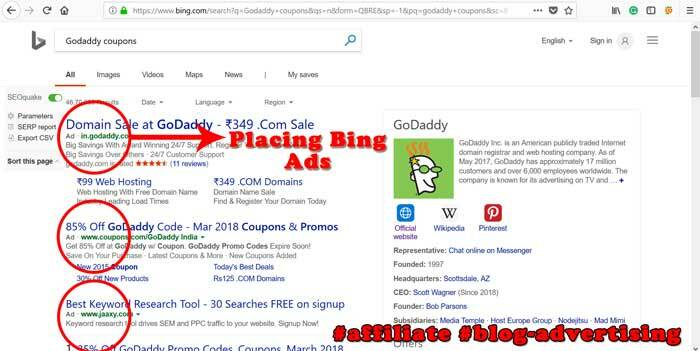 Having options for extra discount using Bing ads coupons Here you can also Increase and Decrease your bids according to your Queries, Times, and Locations. #4 improves your Rank and gets more traffic. Here, you have the variety of factor which is very helpful to improve website rank and get traffic. Which are in your control and can be improved, Your Paid rank is based on your bid, Quality Score, conversion rate and landing page experience. All of these things are very necessary to get rank on Search engine result page and achieve more ROI. Today, Many Search engines provide you own Paid Ads platform, which is very user-friendly to create any types of ads. According to Source and review, Google Search Engines is a much greater search engine value than other search engine platform, as we all know. Because of its high value in the market, we have to face many difficulties to come on search engine result the first page. If you want to revenues your brand or business on Bing Search Engine Result page then you have faced less difficulty than Google search engine, where you have also some benefits, like Low Bid price, sometimes you can also get better conversion rates and get the high level of customer support.